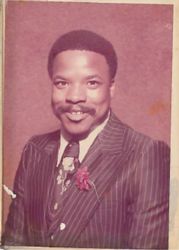 Mr. Rudolph Thomas of Atlanta passed Sunday September 30. 2018. Greetings..From the entire Baker Family., Our deepest thoughts and prayers are with you..!! My sincere condolences to the family. Peace and love. I was sorry to read about the loss of your dear loved one. The bible gives us hope of seeing them again in the promised resurrection according to these scriptures [John 5:28-29] and [Acts 24:15]. We find further hope in [Isaiah 25:8] and [Revelations 21:3-5] which says in part that Jehovah God will wipe out every tear from our eyes, by swallowing up death forever. I hope these scriptures will be of some comfort. Sincere Condolences. My deepest sympathies to the Thomas family. I know that your family is experiencing the loss of a dear loved one. This indeed is a very painful time. Rest assured that our loving God, Jehovah, is certainly aware of how you're feeling. In His Word, the Bible, he promises to raise up our dear loved ones through the beautiful hope of a resurrection. (Acts 24:15) May "the God of comfort" give you the strength to get through the days ahead. (2 Corinthians 1:3, 4) If you would like to know more about the hope your dear loved ones have, feel free to visit jw.org.